Hyland House, South Yarra, 1985. First Edition. Hardcover. Very Good Condition/Very Good. the only damage of note is a fine speckle of foxing to the top edge of the text block, and a trace of foxing it to the top quarter inch of the inside of the dustjacket. Otherwise without damage. Illustrated with end page maps, and numerous photographs and drawings,. The book includes a glossary, bibliographic references, and an index of aboriginal people as well as a general index. 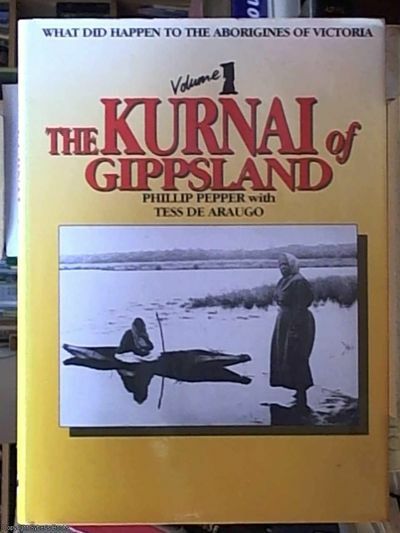 This book quite simply traces the history of the Kurnai tribes from the coming of white settlement in the mid-1830s to the late 1950s, starting with an outline of their life before the invasion. Size: 8vo - over 7¾" - 9¾" tall. Please refer to accompanying picture (s). Quantity Available: 1. Category: Indigenous Cultures; Australia; Sociology & Culture. ISBN: 0908090803. ISBN/EAN: 9780908090808. Inventory No: 0249045. . 9780908090808 THIS BOOK WILL INCUR EXTRA POST OUTSIDE OF AUSTRALIA, BECAUSE IT IS OVER 1 Kg WITHOUT PACKAGING, PLEASE ENQUIRE BEFORE ORDERING.